Amongst mid-century modern-philes like myself, a Joseph Eichler house is like a piece of Eames furniture: a fine example of accessible and timeless modern design. Because Joseph Eichler was actually a prolific developer, not an architect like most surmise, Eichlers are fairly ubiquitous in the Bay Area, found in communities from all the way from Walnut Creek to San Rafael to San Mateo to San Jose, and a few areas in between. 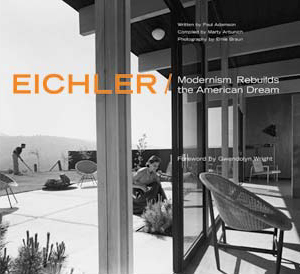 Notably, Eichler was a visionary in many ways, particularly his idea of promoting inclusive and diverse communities for the middle-class. So while owning an Eichler today has cachet among the yuppie crowd and design enthusiasts, back in 1950’s, when they were initially released as new planned communities, an Eichler was a home for the everyday family. Hence, Eichlers themselves are not particularly luxurious in size nor amenities, especially compared to new construction today. So it’s common for many Eichler owners of today to renovate their homes to bring some 21st century to the mid-century. That was the case when I got a from my clients on this project, an All-American, on-the-move, family of four, including two three and five-year old boys, who decided to renovate both the bathrooms of their Palo Alto Eichler when a foundation issue in the master bathroom resulted in some substantial repairs. 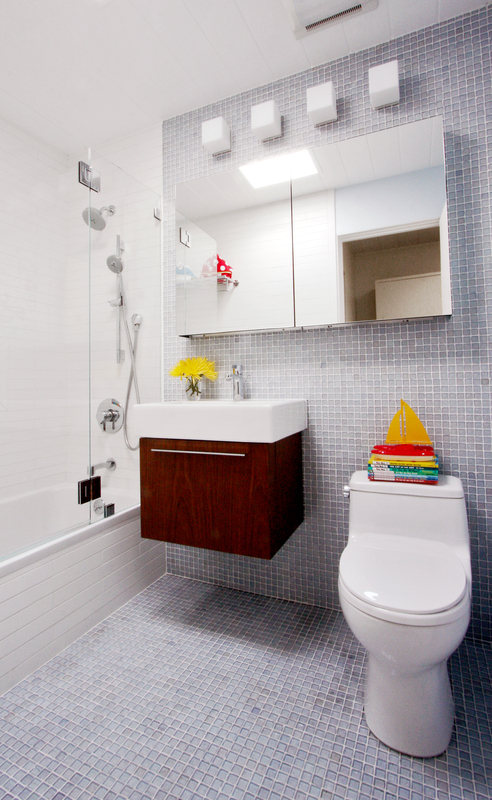 Like my Marina bathroom, both these bathrooms were small and identically-sized at a little less than 5′ x 8′. In a modern house, that’s a powder room, but here, these were full baths, even the master. When you have a 5′ x 8′ envelope, 8′ ceilings, post and beam construction (meaning zero attic area to play with) , and both bathrooms back-to-back (making interior wall space a premium because of the labyrinth of plumbing and electrical to support both), you have to get creative with the design as interior architecture-wise there are not many places to go. The first thing we specified for this bathroom was the two sets of medicine cabinets, which interestingly anchored the room functionally and aesthetically. Aesthetically, we wanted to use visual tricks as much as possible to maximize the feel of the space so we used a two sets of mirrored, frame-less medicine cabinets side-by-side to stretch the room horizontally and make it look bigger. The other effect that this had was to give the bathroom a sense sleekness with the near wall-to-wall expanse of mirror cantilevering from the wall. Functionally, these medicine cabinets held so much stuff and had useful features like integrated electrical outlets (freeing the vanity of any clutter from electric gadgets and the wall from another electrical plate) and even an integrated LED nightlight! With the storage issue settled, we had a some leeway to have some fun, within the confines of the small space, with the sink. We found a wall-mounted unit that came with an integrated sink and cabinet, which we specified in a walnut finish and white porcelain top. The sink and the “countertop” were formed from one seamless piece of porcelain for ease of cleaning, and the single drawer underneath was surprisingly deep and well laid-out. 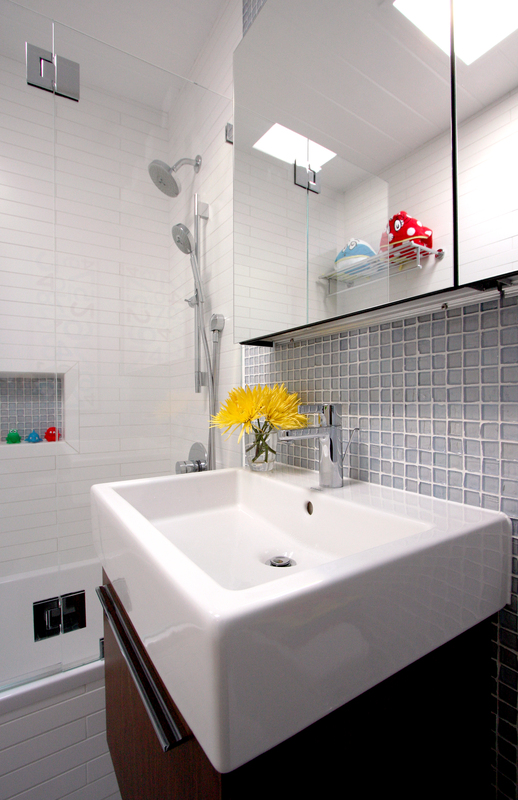 Design-wise, this slim, wall-mounted unit was scaled perfectly for the bathroom and allowed us to keep the ground bare, freeing up the tile to run continuously across the floor – again making the room look and feel bigger. Those two items settled, the question became how to clad the walls and floor. Because the room was so small, we had no problem running the tile floor-to-ceiling where appropriate, knowing this wouldn’t break the bank. So we began to discuss how many colors and types of materials we should use, and where specifically where each element should start and stop. In a small space, too many colors and patterns can look busy and overwhelming so we decided on two colors and materials. Of those two, we knew that one would cover the tub area and one would cover the primary wall with the medicine cabinets and the sink. But then which material should the floor be? We ultimately decided that the wall and floor would be the same material so that someone entering the bathroom would initially see a single color and material. The idea was that the material would wash down the wall and flow into the floor. 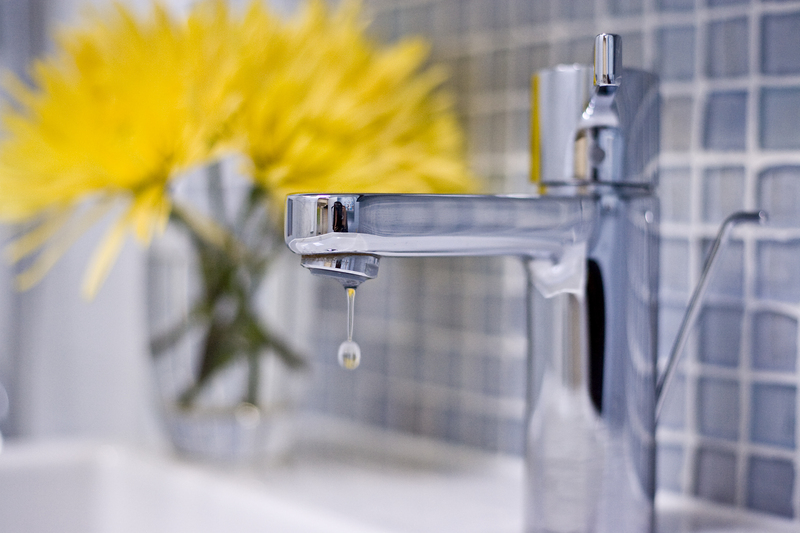 The simplicity of using one color and material make the bathroom sleek. 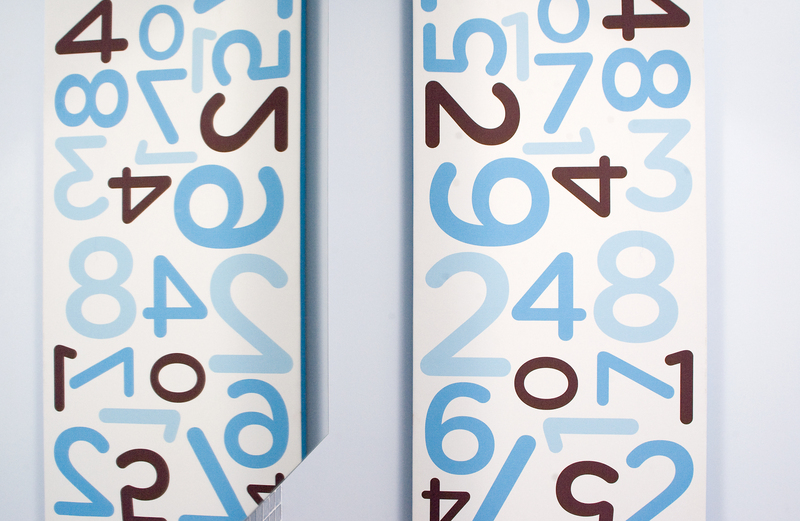 Conceptually aligned, we then began to focus on finding the actual materials. The client was initially drawn to a very sophisticated but cold palette of grays, blacks and white. 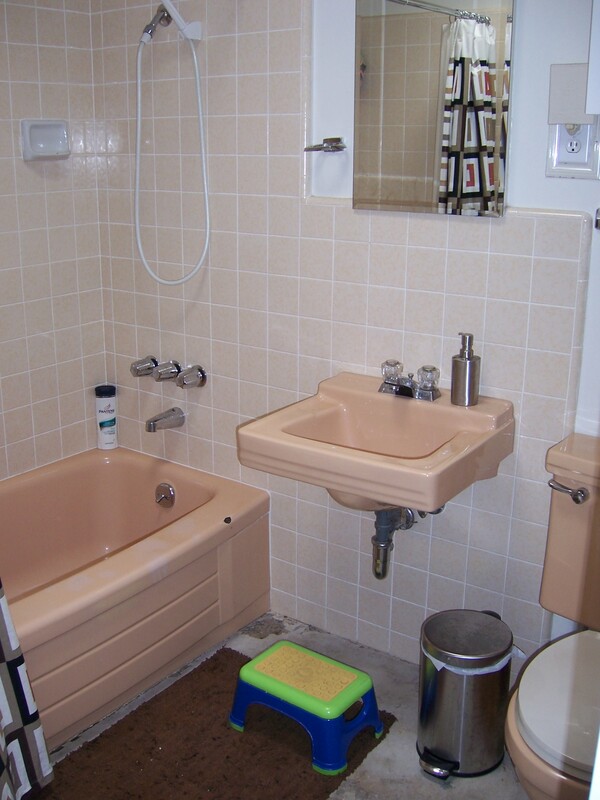 Though I love those colors, and would easily specify in them in say a bachelor’s bathroom, or a dedicated powder room, it didn’t seem to fit the purpose of this bathroom nor the ethos of the house – which was signature Eichler light, bright and airy. So we eventually settled on a palette of pale blue and white, a nod to the boys but also something that I saw as soothing, clean and fresh. The main wall and floor tile was a gorgeous transparent, crystal blue 1″ x 1″ recycled glass mosaic, which reminded me of that metaphorical water running down the walls. I love using irregular-shaped wall surfaces (in this case the recycled glass mosaic, which is slightly uneven when tiled) because when properly lit, the textures that result are amazing. 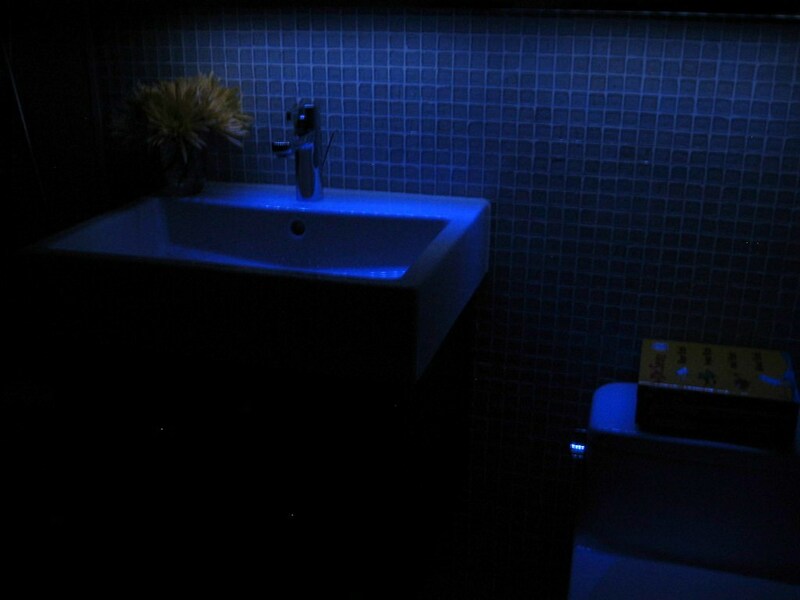 The LED nightlights in the medicine cabinet are not meant for providing down-lighting but in in this case they kinda of did, which was a nice touch. Around the tub, we used the same distinctive but simple matte white Italian porcelain tile that we used in my Marina bathroom. This time however, we wanted to use the tile’s exaggerated shape to make the bathroom appear wider so we laid it out in an offset pattern horizontally. Instead of the tiling the entire tub area in the white tile, we decided to add some levity and a pop of color to the room by tiling the back wall of the niche with the blue mosaic. 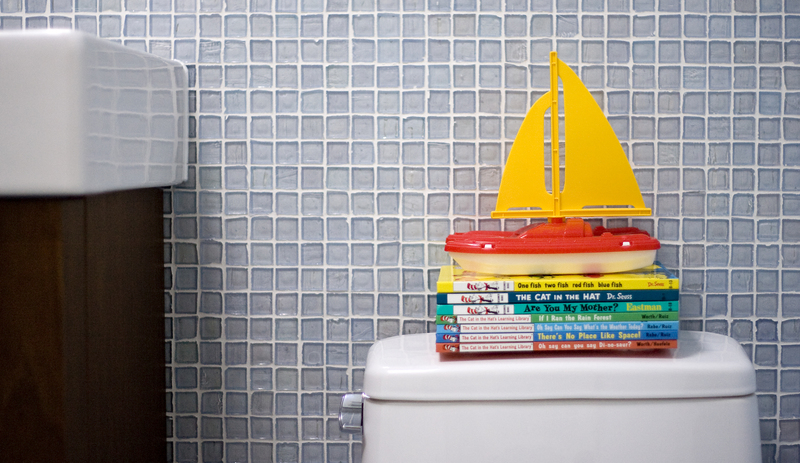 Since this was a kids bathroom, this little gesture seemed fun and appropriate. 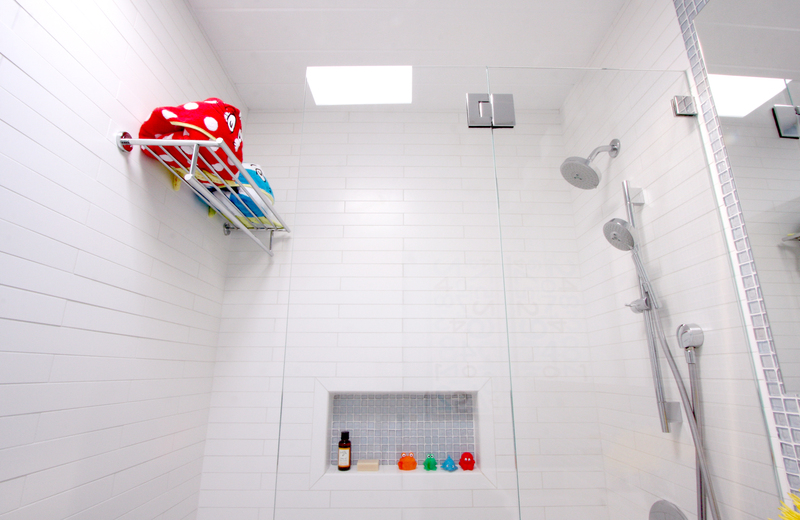 Though it was a kids bathroom, we didn’t scrimp on the details – so they too got a frame-less shower panel, German drop-in tub and German fixtures. As for the finishing touches, I want to highlight two: the lights and the towel shelf. Configuring lighting in an Eichler is tough because of the aforementioned ceiling constraints (no crawl-space in the ceiling means electrical changes impact the roofing which is expensive). So with the one existing electrical connection we had in the ceiling needed for the exhaust fan, lighting had to be on the walls. 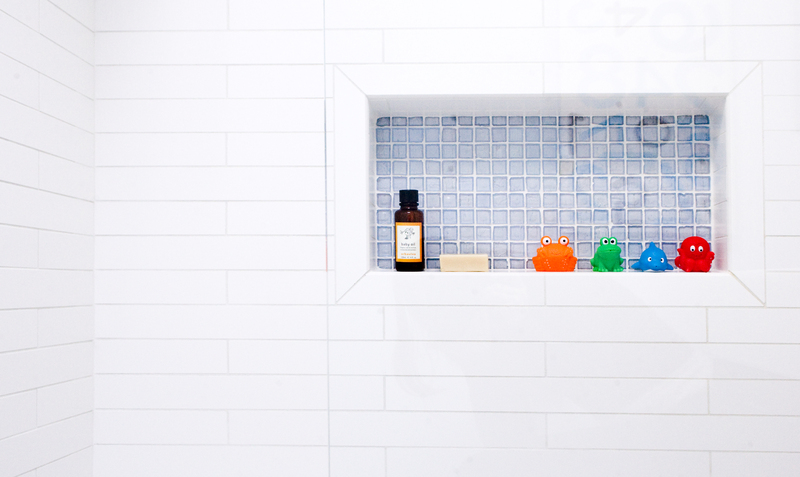 We ultimately found a small, simple cube-shaped sconce in frosted glass that aesthetically and thematically worked with the square glass mosaic wall tiles. Because these were small in keeping with the room’s scale, we were able to fit four across the top of the medicine cabinets, which provided even, diffuse lighting. Because the room was small and almost every wall area was used or inconvenient, there was a challenge to even find a place to hang your towels. 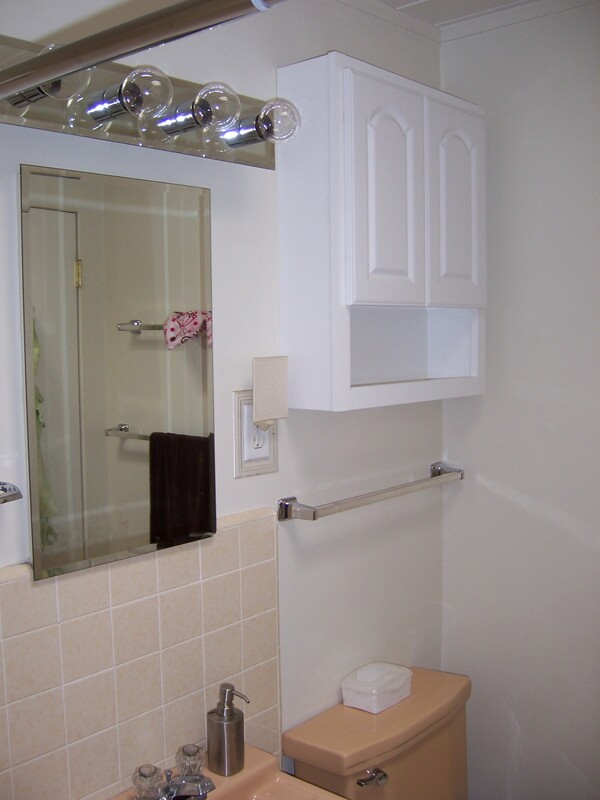 The solution was a a design trick I have used since my first house that owned (which is where I first began working with small bathrooms) – a hotel towel bar. As its name implies, the hotel towel bar is commonly seen at hotels to house extra towels for guests. Being that I’ve always been drawn to hotel design, I’ve always liked the looks of these units as well as their functionality – as they are yet another storage opportunity. On other projects, I’ve used them above a toilet, but when space becomes an issue, I use them inside the tub area. 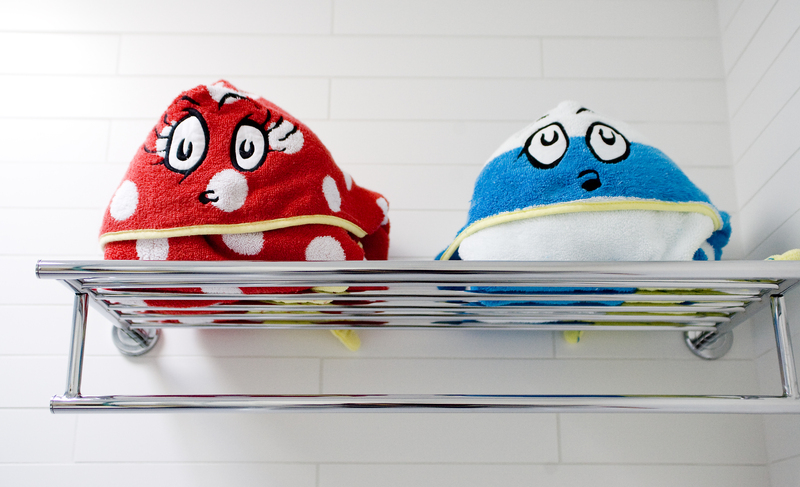 They occupy that void at the foot of a tub and give showerees instant access to a towel when they are done. And as I’ve had to explain many times, no the towels do not get wet – the water doesn’t shoot that far and usually there’s a body in the line fire preventing any soggy towels. Designs for Modern Luxury is a blog by Karman Ng, principal of Cantilever Design, an award-winning interior design firm located in the San Francisco Bay Area. Always reading, researching and reveling in “the best of design” for himself and his clients, Karman began his blog as a way to share his thoughts and finds-from furniture to fashion to food. Karman hopes his blog fosters dialogue and sharing of design-related products, news, tips, ideas and secrets so that everyone can enjoy a little bit more modern luxury in their lives. For more information about Cantilever Design, visit http:///www.cantilever-design.com or follow Karman at http://twitter.com/karmanng. 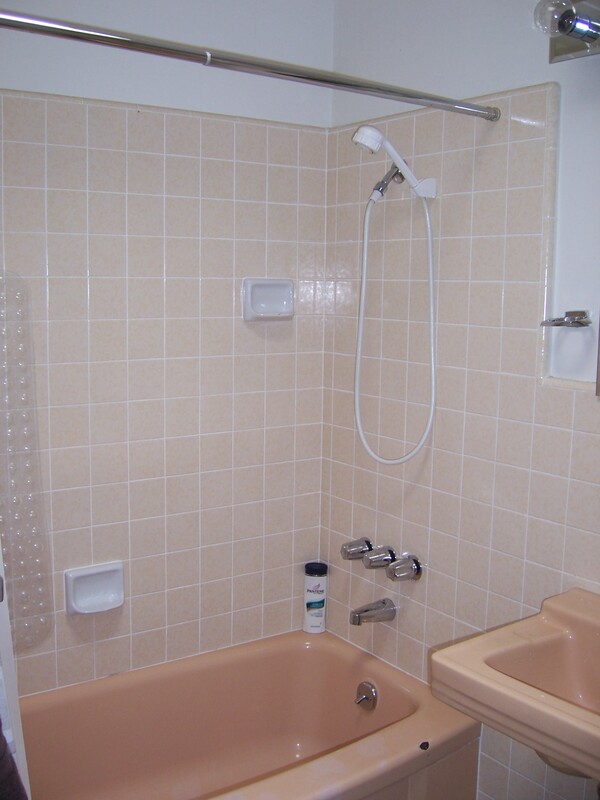 This entry was posted in Uncategorized and tagged Ann Sacks, Duravit, Hakatai, Hansgrohe, hotel towel bar, Itre, Joseph Eichler, mid-century modern, Robern, Toto. Bookmark the permalink.